I’m making more of an effort to study the bible. A habit I’ve not developed & is partially hard for me because I read so slowly. 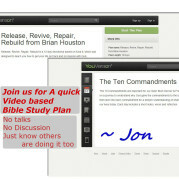 A little while ago I started using short little bible study plans from youversion / bible.com. I and a few others just finished doing a 10 day series focused on the most popular verses in the bible. Now, we are ready to start a new series. It’s really simple, get the bible app for your phone or tablet. Get an account from bible.com & subscribe. Each day you go into the app, watch a short video and read a single sentence or two. You can do it on a computer too, but most of us are using our handheld devices. 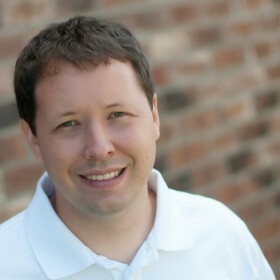 I asked the people I know did this past session & the feedback I got was that the video element really helped, I agree. I’m down to two options & would life feedback. You can send it either in the comments here or message me directly. 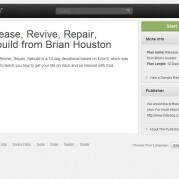 Release, Revive, Repair, Rebuild is a 12-day devotional based on Ezra 9, which was designed to teach you how to get your life on track and on mission with God. 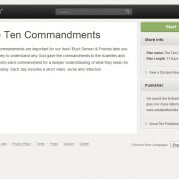 The 10 Commandments are important for our lives! Buck Denver & Friends take you on a journey to understand why God gave the commandments to the Israelites and then dive into each commandment for a deeper understanding of what they mean for our lives today. Each day includes a short video, verse and reflection.